Jam Session is the lushly photographed and selective guide to making all-natural fruit preserves, organized by type of fruit and seasonal availability, with descriptions of the best varieties for preserving plus master recipes and contemporary variations for each type of fruit. Master preserver Joyce Goldstein includes straightforward, no-fail instructions for canning fruit preserves, along with serving ideas for using preserves for much more than toast, including Mango-Lime Jam to elevate pork tenderloin, Pickled Peaches to perk up fried chicken, and Apricot Jam to glaze cake. Packed with ideas, 75 time-tested recipes, and gorgeous photographs of produce, process, and finished fruit preserves, preserving newcomers and veterans alike will find Goldstein’s handbook just the right amount of instruction and and inspiration. An authoritative guide to Jewish home cooking from North Africa, Italy, Greece, Turkey, Spain, Portugal, and the Middle East. It is a treasury filled with vibrant, seasonal recipes—both classic and updated—that embrace fresh fruits and vegetables; grains and legumes; small portions of meat, poultry, and fish; and a healthy mix of herbs and spices. It is also the story of how Jewish cooks successfully brought the local ingredients, techniques, and traditions of their new homelands into their kitchens. With this varied and appealing selection of Mediterranean Jewish recipes, Joyce Goldstein promises to inspire new generations of Jewish and non-Jewish home cooks alike with dishes for everyday meals and holiday celebrations. “Joyce Goldstein not only inspires you to cook, it also educates. She dismisses the notion that there are two styles of Jewish food, one Ashkenazi, from Eastern Europe, and another Sephardic, from southern Europe and the Middle East. It’s not so simple, she says. She parses more than 400 recipes from her own repertoire and other sources and discusses how Jewish food has changed. Passover recipe inspirations include leek fritters, Italian soup with chicken dumplings and a lamb tagine with raisins, almonds and honey” —Florence Fabricant, New York Times. “You see the sheer bounty and diversity of the Jewish cuisines of the Mediterranean and Middle East in the book’s 425-plus recipes. 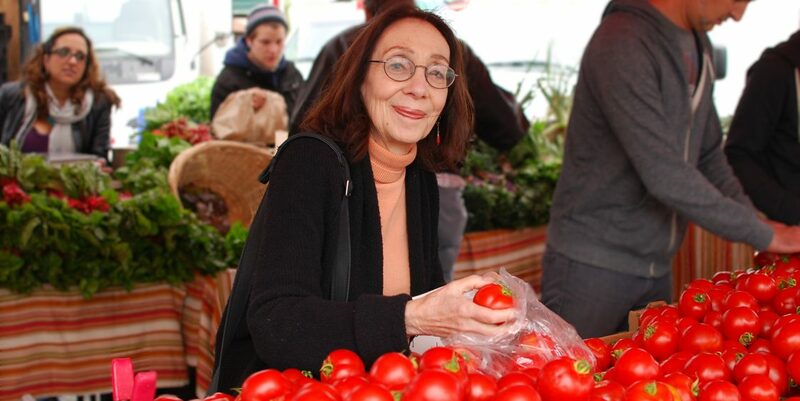 Goldstein backs up her recipes with practical tips and clear instructions but also dives deeper, weaving in history and culture of the Mediterranean Jewish communities with meticulous sourcing and credits. . . . Her scholarship makes for a fascinating read.”— Chicago Tribune. “A deep, rich dive into Mediterranean Jewish culture.“— San Francisco Magazine. “A virtual encyclopedia of everything you’ve ever wanted to know about the foods of the Mediterranean. . . . This is not just a cookbook. It is a delicious food history book.”—Canadian Jewish News. “Feels like the culmination of a lifetime’s work.” — The Globe and Mail. An immensely readable insider’s account, celebrated cookbook author and former chef Joyce Goldstein traces the development of California cuisine from its formative years in the 1970s to 2000, when farm-to-table, foraging, and fusion cooking had become part of the national vocabulary. Interviews with almost two hundred chefs, purveyors, artisans, winemakers, and food writers bring to life an approach to cooking grounded in passion, bold innovation, and a dedication to “flavor first.” Goldstein explains how the counterculture movement in the West gave rise to a restaurant culture characterized by open kitchens, women in leadership positions, and a surprising number of chefs and artisanal food producers who lacked formal training. The new cuisine challenged the conventional kitchen hierarchy and French dominance in fine dining, leading to a more egalitarian and informal food scene. In weaving Goldstein’s views on California food culture with profiles of those who played a part in its development—from Alice Waters to Bill Niman to Wolfgang Puck—Inside the California Food Revolution demonstrates that, while fresh produce and locally sourced ingredients are iconic in California, what transforms these elements into a unique cuisine is a distinctly Western culture of openness, creativity, and collaboration. Engagingly written and full of captivating anecdotes, this book shows how the inspirations that emerged in California went on to transform the experience of eating throughout the United States and the world. “Thoughtfully woven related themes include sustainable agriculture; differences between Northern and Southern California kitchens, from guiding principles to plating styles; perspectives among self-taught and professional chefs; increasing acceptance of ethnic dishes; the popularization of open kitchen designs, and more. While several interview highlights detail the beginnings of particular restaurants, with frequent mentions of Spago and Chez Panisse, the most perceptive accounts consider broader philosophies on everything from dining habits to ingredients. For the most dedicated food historians, the narrative reveals a period rife with invention. Facsimiles of menus provide glimpses at past trends and staples. Goldstein convincingly presents a case for California cuisine as a vital force in strengthening connections among food, chefs and diners in ways that have transcended region.” — Kirkus Reviews. “When the time came for a definitive record of California cooking, UC Press knew the exact person to pen it. After almost 200 interviews with chefs, critics, food artisans, iconoclast winemakers and restauranteurs, the doyenne has tracked a 30-year shift in design, casualization and style.” — C Magazine. “A book for anyone who loves to eat and who wants to understand why eating has gotten so delicious.” — San Francisco Chronicle. “A lot of interesting anecdotes. . . . Indeed, for anyone who wonders what those wild early days were all about, ‘Inside the California Food Revolution’ will be a valuable resource.” — Los Angeles Times Daily Dish. “Insightful and compelling . . . . As engaging as it is educational.” — Restaurant Hospitality. 1977 Feedback: Cooking as Communication – R. Marek, N.Y.
1989 The Mediterranean Kitchen – William Morrow, N.Y.
1992 Back to Square One – William Morrow. 1997 Kitchen Conversations – William Morrow, N.Y.